Nutritious little bites of goodness, also known as energy bites, are pretty much always a yes. So what about when they are conveniently little energy bites that taste like peanut butter chocolate chip cookie dough? These energy bites are MY ENTIRE LIFE right now. Like many other good recipes in my life including these Chicken Tinga Tacos which I make reeeeligiously, these energy bites came into my life by way of the Minimalist Kitchen cookbook – and so many positive reviews to prove it on Amazon! These are energy bites, but also they are kind of cookie dough. I mean, let’s be real – these aren’t the butter and sugar kind of cookie dough, and I am all about that goodness in my life, too. But being that I’m pregnant, I can’t / probably shouldn’t eat cookie dough right now, and these energy bites are just checking all the flavor/texture/nutrition/convenience boxes for me while also reminding me of peanut butter chocolate chip cookie dough. Main ingredients are always on hand: oats, coconut, peanut butter, honey, chocolate chips. But not, like, grossly nutritious, you know? They still taste really good and can stand in for dessert. Amazing texture. Just the right amount of squish and chunkiness. Excellent with coffee for a mid-morning snack. No dates!!! I repeat: NO DATES. I love dates as a base for energy bites and healthy desserts, but sometimes it’s nice to take a break. First. Grind up your oats and your unsweetened coconut. Now add your extras – and this is where you can have a little fun. I normally use honey, peanut butter, chocolate chips, and chia seeds (HEALTH, obviously). But you can also use almond butter, maple syrup, no chocolate chips, hemp or flax or something else altogether. You get the idea. Then, you are basically done. Just roll up that “dough” into little balls and pop it into the freezer so they get nice and solid. Pop goes the top, and there is my nutritious, bite-sized, cookie-dough-like energy bite! I am making a batch of these little guys every 1-2 weeks, and it’s just my favorite thing about life right now. These nutritious little energy bites taste a whole lot like cookie dough! This recipe was adapted from the Minimalist Kitchen cookbook! The major changes that I made were omitting the dried fruit, using peanut butter instead of almond butter, and swapping chia for hemp. Pulse the oats and the coconut until coarsely ground. 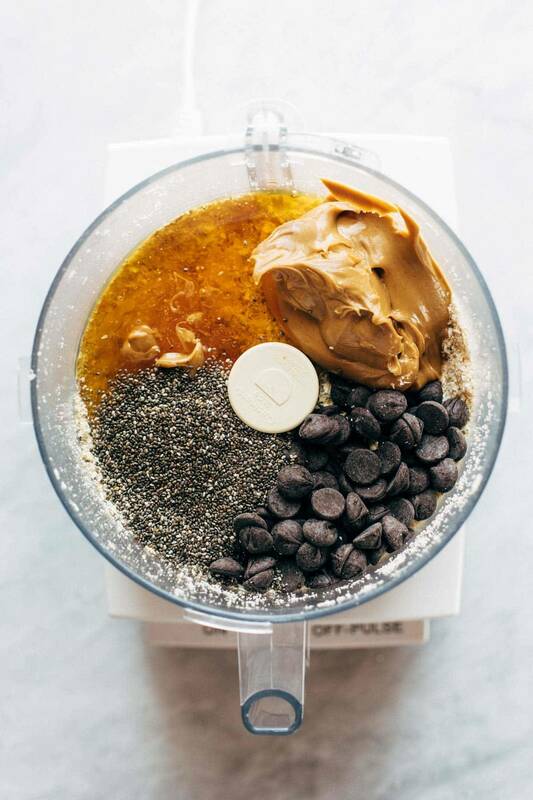 Add peanut butter, honey, chia seeds, salt, vanilla, and chocolate chips. Pulse again until well-mixed and the chocolate chips are cut into smaller pieces. Roll into balls. (If it’s too dry, just add a little more honey / peanut butter and mix again – I usually just eyeball the amounts until it gets sticky enough). Freeze until solid. Store in freezer or refrigerator. I have made anywhere from 20-40 bites with this recipe – it all just depends on how big you want them. 20 for a larger size, 30 for a medium size, and 40 for a smaller size. Looks wholesome and yummy. I really like all the different natural ingredients that went into that. Literally just popped a batch of these (minus a couple :D) into my freezer. These were so easy to throw together with things I already had in my pantry! They are SO delicious and sure to be a hit at the cookout I’m bringing them to tomorrow! How many are considered a serving, for 115 calories? One, two? I’m curious about serving size also! These look great. These look awesome and can’t wait to try them. Do you use a particular brand of chocolate chips or the “healthier ” ones? Also, how many are a serving? Thank you! These look soo yummy! and yay to NO DATES! My husband isn’t a fan of oatmeal, it makes him tired when he eats it, so I’m wondering if there’s any substitute for the oats? I realize it’s basically the base for the whole recipe but hoping you’ll have an idea for me…???? Hi Audra! That’s a tough one. 🙂 You could maybe give some sort of rice cereal a try? I’d try adding a little more peanut butter! Hi! Looks great. What brand of peanut butter did you use? oh I was so happy when you said they didn’t have dates in them???? dates DO have their place but fiiinnally.. change it up ya know??! anyways I’m enthused about these energy bites. because who wouldn’t want LEGIT healthy cookie dough????? I’ve made various energy balls many times in the past, but this is my new favorite recipe (it’s my husband’s too– AND he normally doesn’t like these types of things!) Thank you! Ooh, these looks very good! Pretty amazeballs! 🙂 Can’t wait to ask my wife to try this for our Sunday brunch! I made these for the first time 2 weeks ago, and we loved them! I stored them in the freezer and then we were able to grab one whenever we wanted a little pick me up! I am making them again today! Thanks for a great recipe! Glad you enjoyed them, Diana! I just made these and they are so good! 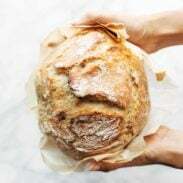 Just a tip – I added flax meal and brewers yeast to make them more of a lactation bite, too! That’s so great! Glad to hear it! Made these this evening – so easy and delicious. Planning on chowing them down during my postpartum period for a little extra energy boost. Another solid recipe yum yum yum!! How many would you suggest eating at a time? Is the serving size one ball? These are really great. My husband, 4 yr old and 2 yr old love them. They are great for a snack and they have become a lifesaver when me and my husband want something sweet but want to stay healthy. Thanks! I made these with my three-year-old because we had to stay home from church since she was just a little bit sick. They were a lot of fun to make and she got to do a lot of it by herself. Thank you for the great recipe. They’re in the freezer and ready for Big Brother and Big Sister lunch boxes next week! These are so crazy good, but they’re dangerously addictive. I did end up adding an extra couple of tablespoons of peanutbutter and another teaspoon or so of honey to keep them from crumbling when I rolled them. They’re going to become a staple. How long do these stay fresh in the fridge? We’ve been goobling them up in less than a week but went on vacation and wondering if the two week old ones at home will still be good.